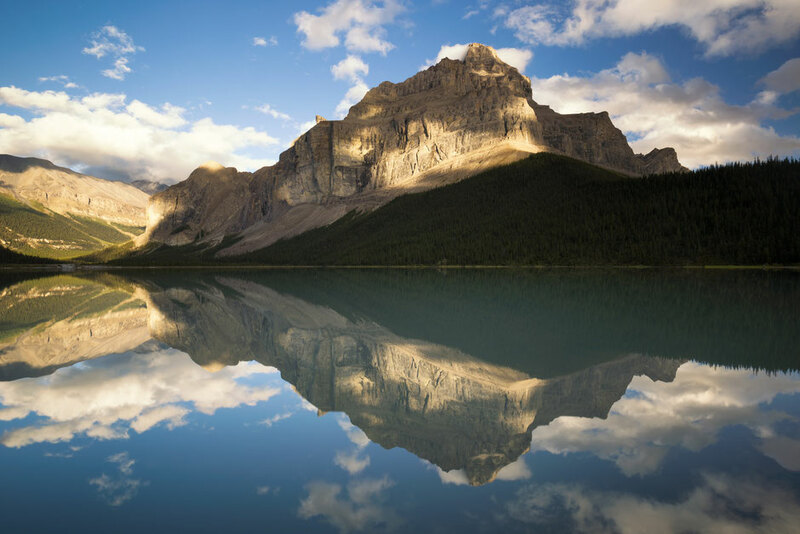 The most iconic location in Jasper National Park - Spirit Island has to be seen to be believed. Named after a beautiful anecdote of star crossed lovers from rival first nation groups. Rumour has it that the two soul mates, from two opposing tribes fell in love and used Spirit Island as their secret courtship location. However when the girl's father found out about their private affair he banished her from visiting the island. The young Romeo had no idea why his darling sweetheart stopped visiting but continued to frequent the island daily until he breathed his last lonely breath and eventually died right there on the Island, staring into the Valley of the Gods. His spirit is said to still be waiting there, in the hope, that she'll one day return. 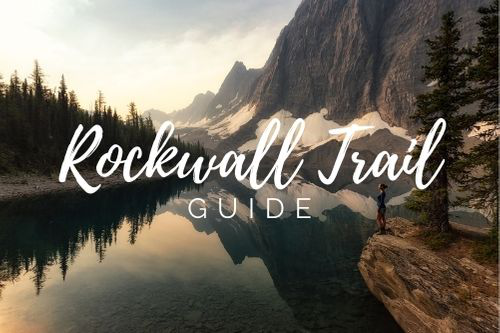 This 3 day paddling guide to one of my favourite multi-day excursions in the Canadian Rockies will make you familiar with all the logistics. 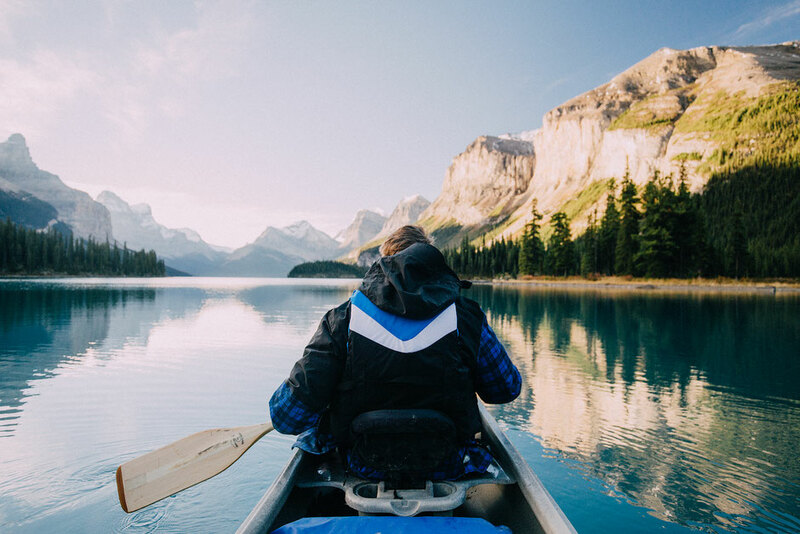 The excursion will take you much further down the lake than Spirit Island, where no commercial boat cruises and less than 0.1% of people, who come to Maligne Lake, ever see! If that doesn't sound appealing to you, I don't know what does! 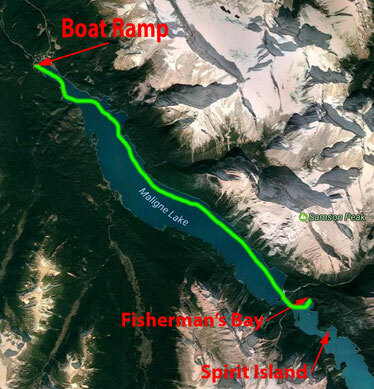 The trailhead for this paddle trip is at the boat ramp at the northernmost point of Maligne Lake. To get there it's a 48 km (30 miles) one hour drive from Jasper along Maligne Lake Road. In my opinion it's one of the most scenic drives in the Canadian Rockies! 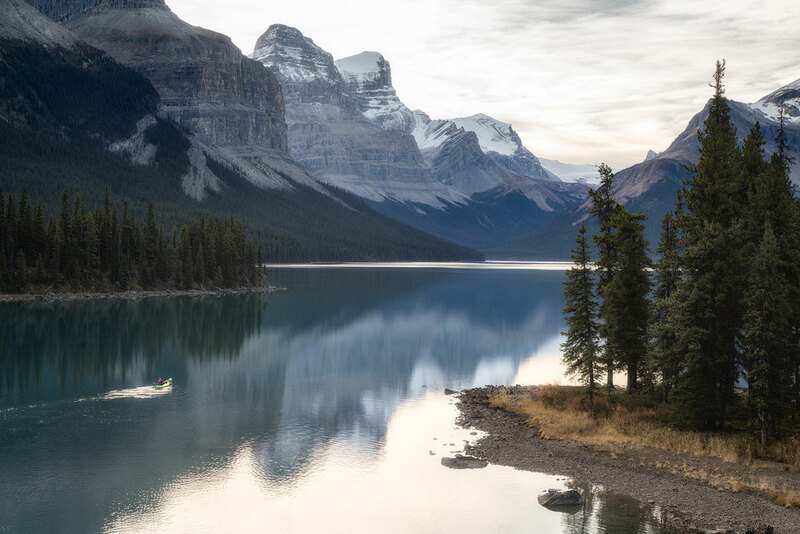 Maligne lake area is also home to some of my favourite day hikes in Jasper and it's where the famous multi day Skyline Trail begins. 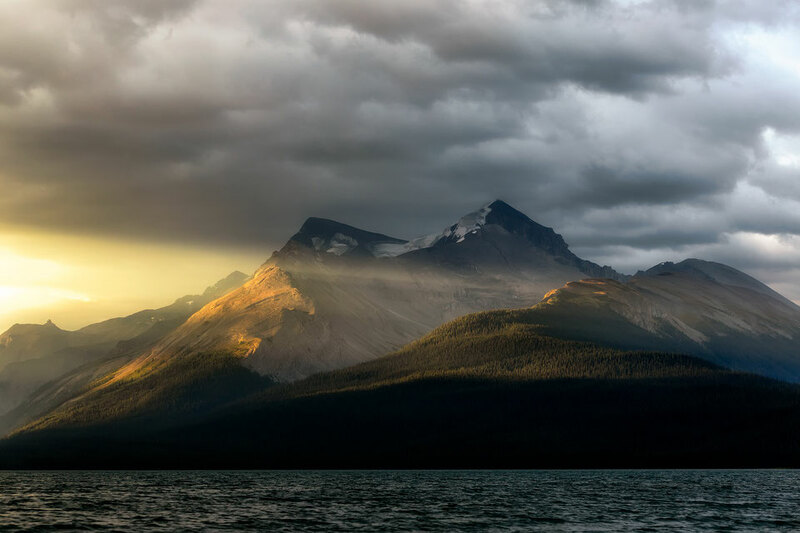 Maligne is a french word that means malignant or wicked. 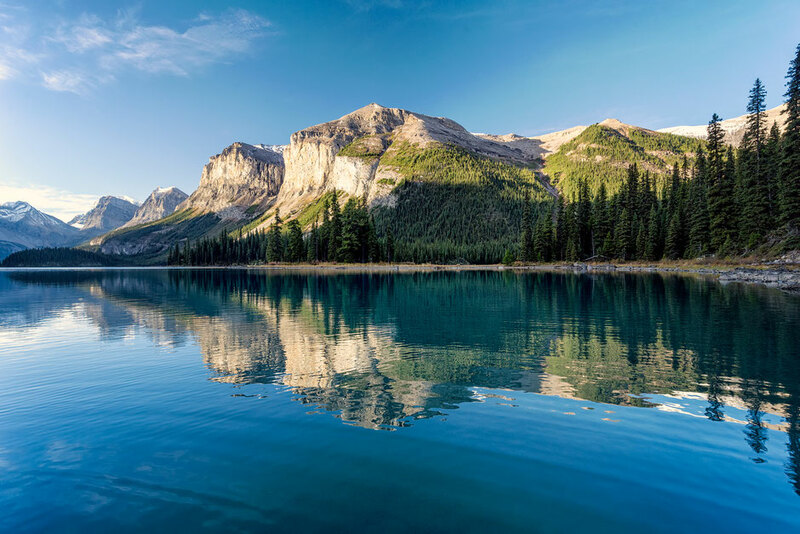 The lake however was not named so because of conditions of the lake, but after the turbulent Maligne River, which empties into it. The best advice I can give you is that, whether you're an experienced paddler, or a relative novice, to start early. Generally the wind conditions in the morning are much less relentless. But hey? I bet you are wondering I don't even have a canoe and you're already telling me about wind conditions! If you're coming to the Canadian Rockies from abroad then chances are you are not going to be traveling with a boat. 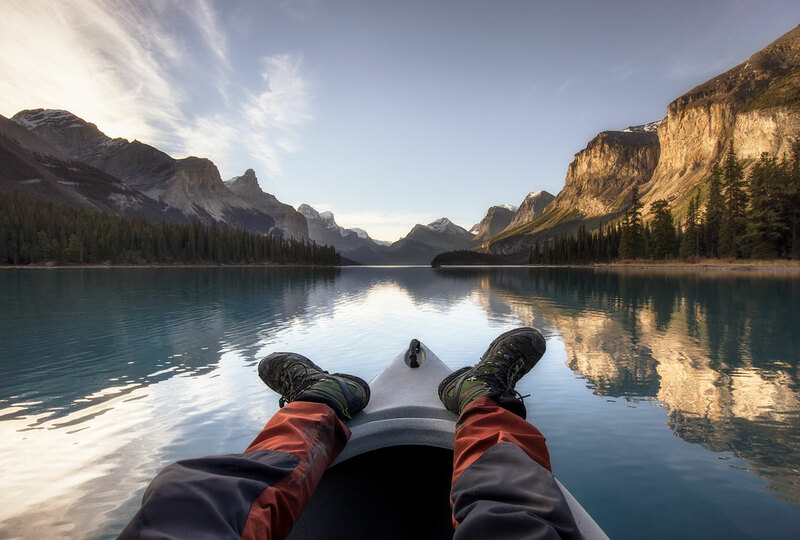 Don't worry, a company called Pure Outdoors in Jasper rents canoes and kayaks. Double canoes cost 90$CAD per day with a 25% discount for each additional day. 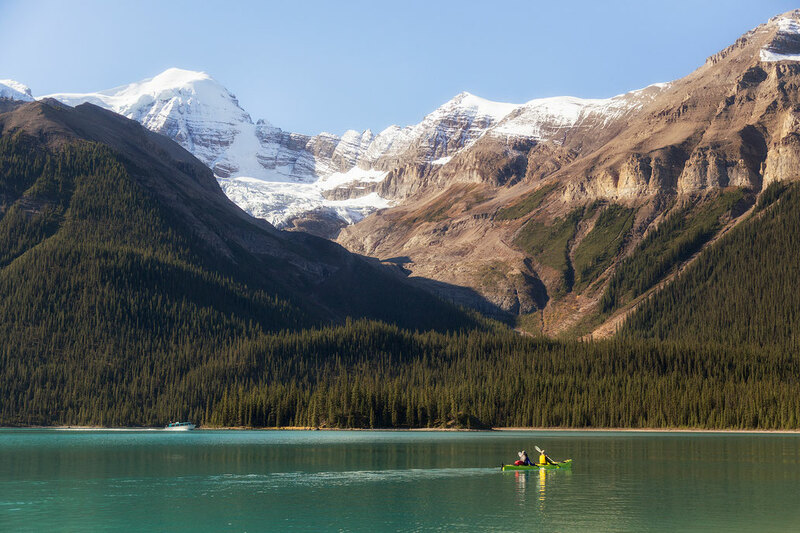 If you're worried about being able to transport the canoe or Kayak from Jasper to Maligne Lake, they have you covered. Pure Outdoors also do a drop off and pick up service free of charge. Life vests, paddles, water pumps, kayak skirts, floatation devices and everything else you can possibly need for your safe passage, is also included in price. The boat cruises on Maligne Lake are operated by a company called Brewster. In the summer cruises leave every 15 minutes and cost 65$CAD per adult for the most basic tour. They also do photography oriented, private guided and fishing tours, all of which cost extra. The basic cruise includes the 20 minute trip to Spirit Island, around 15 minutes at Spirit Island, and the 20 minutes back. It's a money spinning machine if you ask me, and certainly won't offer an intimate experience. Brewster can't operate outside of daylight hours so if you plan on visiting at sunrise or sunset, paddling and camping is your only option. Even if you have your own speedboat it will be good for nothing here. 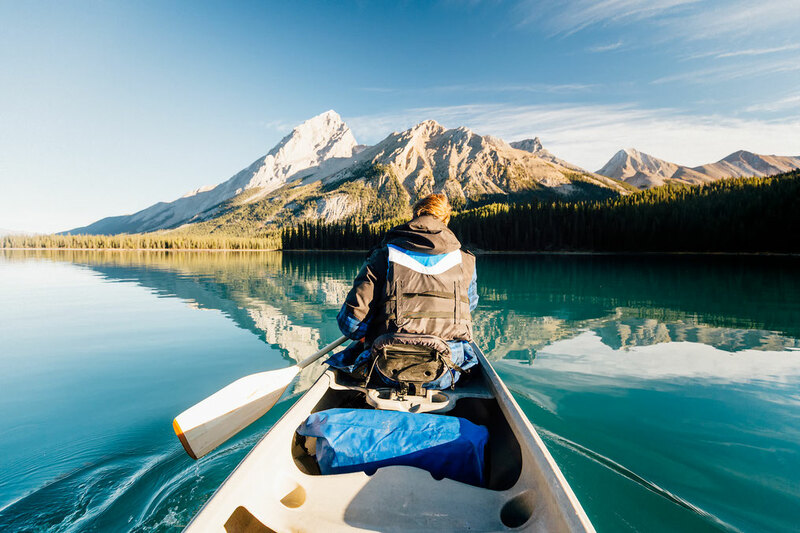 No other gas motorized boats are allowed on Maligne Lake apart from those belonging to Parks Canada and Brewster. Personally if you're physically able to do so, getting there by your own power is so rewarding I would recommend it to anyone. It gives you the opportunity to go past Spirit Island into the heart of the Valley of the Gods, a place where no cruises boats venture. Pristine, untouched and magnificent. 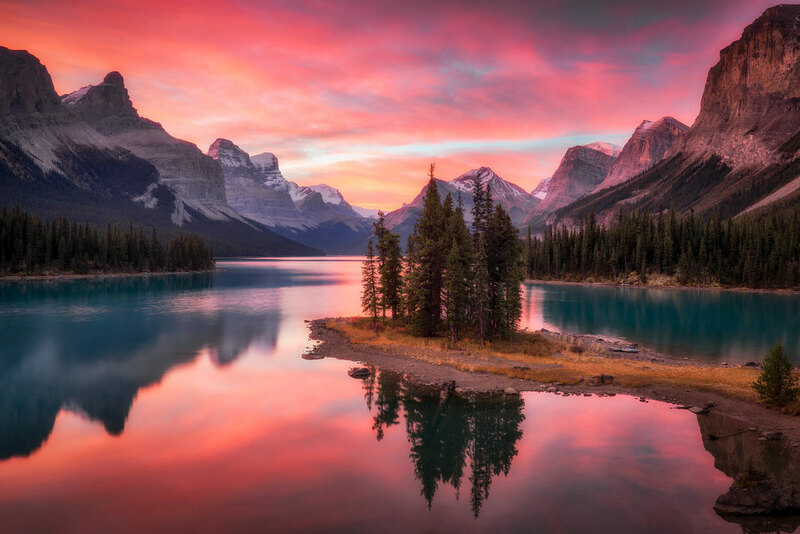 The campsites on Maligne Lake book out very early in the season. Contrary to popular belief the bookings are NOT 3 months in advance. Once they open, normally at the end of January, all weekends in the summer are booked out, within the first couple of hours! By the start of March most sites are gone and by May there's nothing left. At this stage hunting for cancellations, which by the way are quite common, is your only option. Since the reservation system forces people to make plans so far in the future, many simply are not able to adhere to their original travel plans. The campground costs 9.80$ per person per night plus an 11.70$ reservation fee. Bear in mind you will steel required a Parks Pass to enter the parks on top of that. There is a maximum of 6 nights stay (2 at each campground) and you can book for up to 10 people. The rules are strictly enforced. 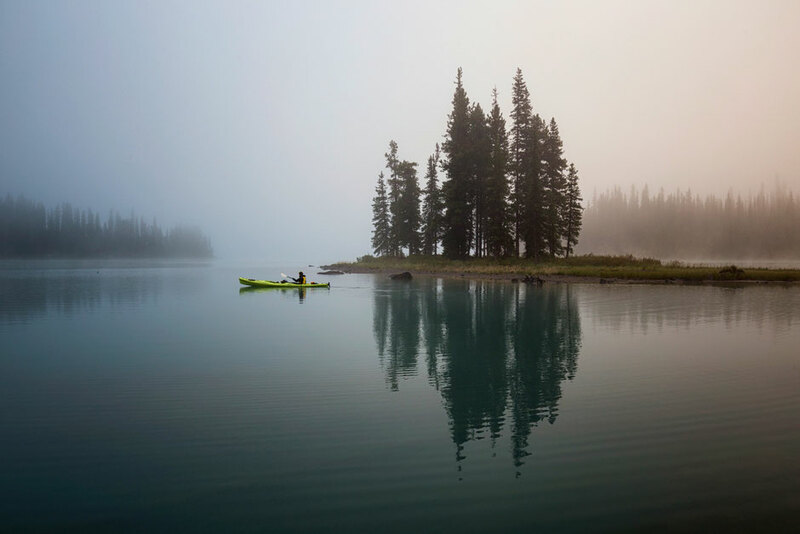 Campgrounds can be booked on the Maligne Lake Reservation Website. Make sure to keep an eye out for the reservations' opening times! Cards are accepted. 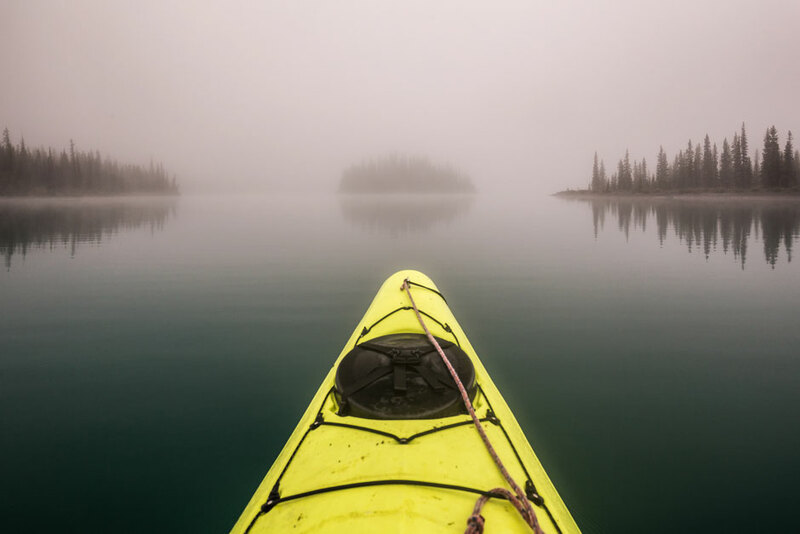 Is it better to do the trip in a Canoe or Kayak? Hmmmmmm tough choice. I've done this excursion in both a canoe and a kayak and personally enjoyed it much more in the latter. If like me, you are a light packer and prefer a bit more comfort, choose a kayak. If you plan on bringing a lot more gear with you, go with a canoe. Normally this would be the part of an itinerary where I start talking about trail conditions. Unfortunately, water is very hard to predict, it's never the same twice. From the boat lunch it's a 13km paddle, as the crow flies, to Fisherman's Bay campground. Start as early as possible to get the best weather conditions (the winds are calmer in the mornings). Moreover you will avoid the boat cruises that normally start at 10am and create some serious waves ultimately slowing you down and taking away from the serene atmosphere of the lake. A strong paddler can get to Fisherman's Bay in 2-3 hours but more realistic time is 4 hours. In unfavourable wind conditions, with a big load it could take a lot longer. If you stay close to the shore, you'll do slightly more than 13 km, but you'll have a much higher chance of seeing some wildlife. 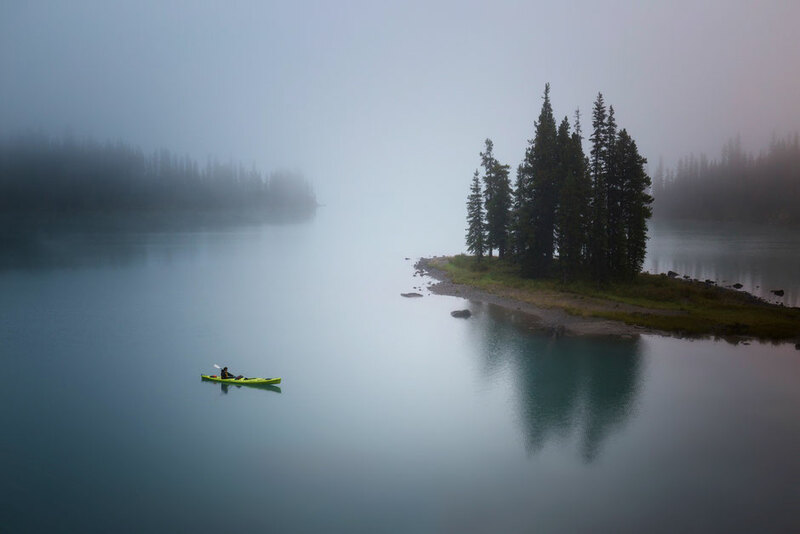 On my second paddle trip on Maligne lake I saw a black bear and several eagles. 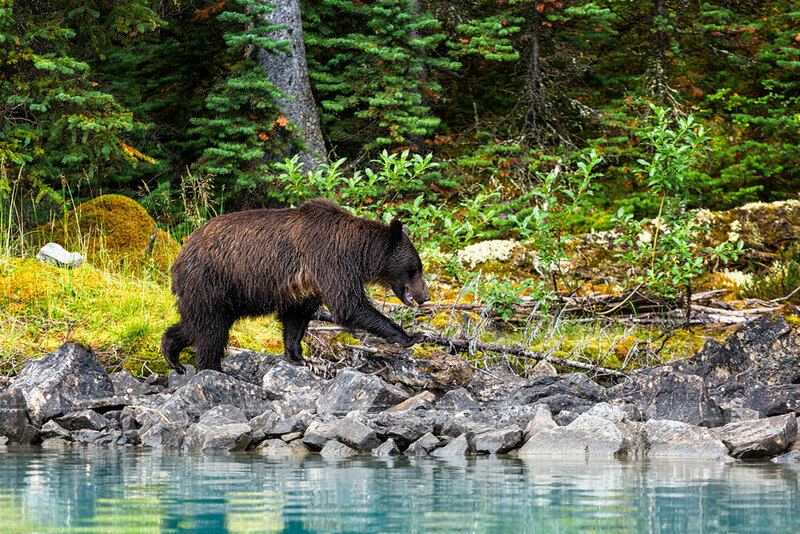 The bear accompanied us for quite some time as we paddled along the shore. At one point it even jumped into the water and swam few meters along the shoreline, before it got out and disappeared into the forest soon after! At roughly 11kms the lake becomes quite thin. That's a sign that you have reached the Samson narrows. Once you're through, the lake opens up again and the Fisherman's Bay campground will be in a cove on the left hand side. From campsite the Spirit Island is only a 15 minute paddle away. After you set up your camp, there's no excuses why you shouldn't go there for either sunrise or sunset. The good news are, you will probably be the only one there! 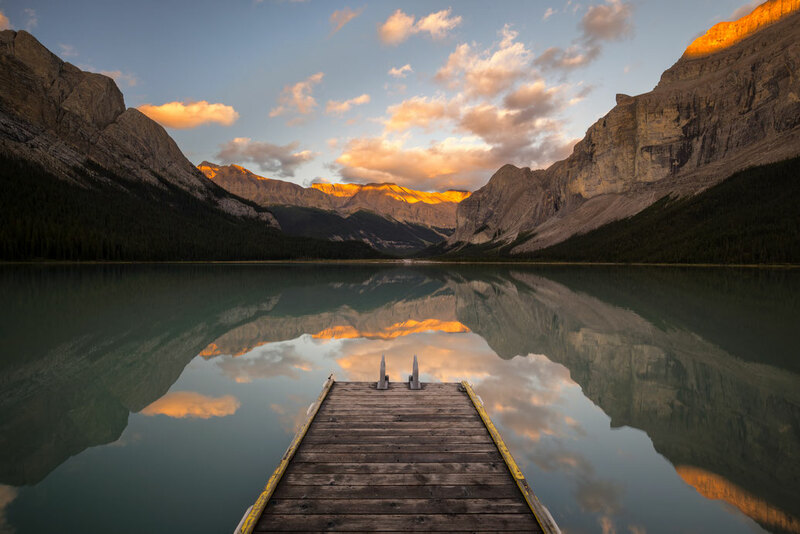 This is where I have photographed my most memorable sunrise in the Rockies to the date. 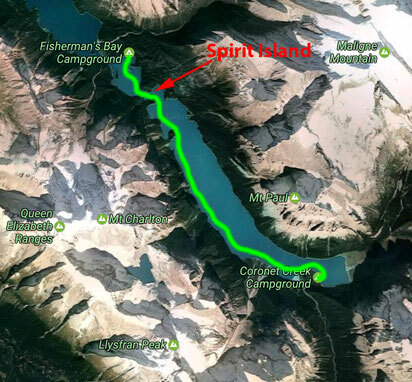 After a sunrise at Spirit Island, and a hearty breakfast back at camp, continue south a further 8 km to the Coronet Creek campground. 2-4 hours later, depending on your speed, you will again stand ashore. This part of the journey is the most spectacular. You will be paddling directly into the heart of the aptly named Valley of the Gods. Once you see it with your own eyes you will understand what I am talking about. The campground lies on the right hand side, just past the Coronet Creek intake. 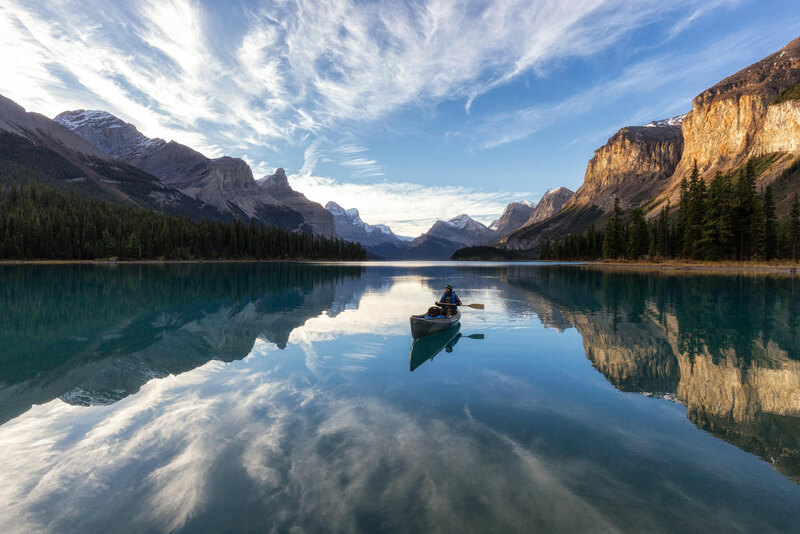 Maligne lake is the second largest glacially fed lake in the world and it's here, between Spirit Island, one of the best places in Jasper to take some killer photographs, and Coronet Creek, that you'll see the waterfalls gushing from glaciers falling effortlessly into the lake. Both campsites are very rustic, but very quiet, only 8 tent pads per site. They have new dry style outhouses (a new pilot scheme being testing by Parks Canada), fire pits and of course, bear lockers. If you are strong enough and have limited time here in the mountains, consider paddling back to the boat launch on the last day, making this a 3 day excursion. However if you have time on your hands stay at the Coronet creek campground for 2 nights and plan a total of 4 days and 3 nights on the lake. Once at Coronet Creek there is a 16km/5 hour return Henry Macleod Trail that will take you away from the water and toward some of the glacial moraines in the area. If you do decide to paddle back the 21 kilometre in a single day, account for around 6 to 8 hours. The last time I did this excursions I managed to paddle back in just 4 hours, but I admit that the speed my partner and I were paddling at was monumental. We were so fast mainly due to the fact, that the wind was non existent. Normally I would also take my time to look at the views, but on our last morning the lake was covered with thick mist blocking them. Whilst 21km may sound like a lot it is definitely doable. Just remember what I said about the winds! The early bird catches the worm! If however it's not something you are feeling particularly excited about, you can always just stay the second night at Coronet Creek then paddle back to the Fisherman's campsite and stay the third night there . 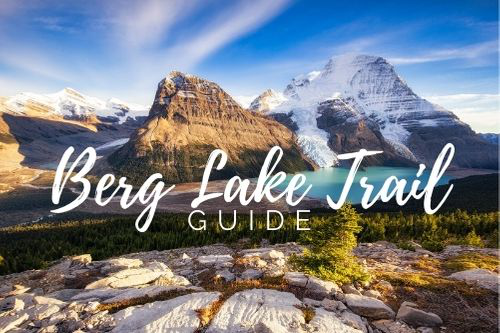 In this case you will find yourself once more within a close vicinity of Spirit Island, where you can take another peek at the beauty of one of the most photogenic places in the Canadian Rockies! After several glorious nights on the lake, you should set off early again to beat the boat cruises, especially if you stayed the previous night at Coronet Creek and have 21 kilometres of distance to tackle. 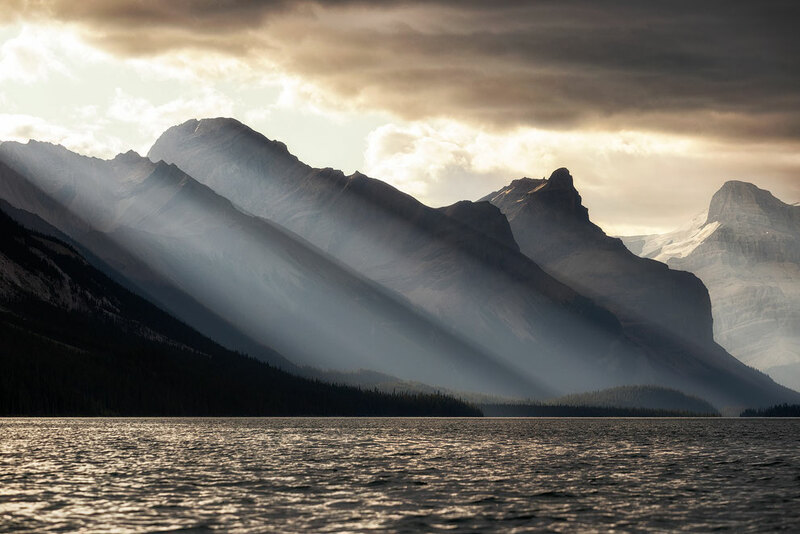 If times get tough, or the wind picks up, think to yourself that you’re doing it to see some of the most untouched pristine landscapes in Canada. If the weather gets really bad consider portaging, waiting until it passes, and then continuing your travels after the storm has passed. There's no shame in seeking shelter whilst you wait for safer conditions. As always if you have any questions or tips don't hesitate to leave a comment below! I am always happy to hear your feedback and stories of your personal experience from the trip!